I'm heading for England tomorrow night, visiting my grandson, playing some music, calling in at the Soane Museum. Looking forward to a change of scene for a couple of weeks. Before I set off, I wanted to report on the work we have done modelling John Soane's Board of Trade Building. There's still a fair amount of work to do, but it's coming along nicely. Quite a decent sheet set coming out and lots of interesting questions about the design process have been revealed. I had a problem syncing to C4R last weekend. Checking the cache I realised that the file size had jumped up rather alarmingly. It's the Site Context file for the Board of Trade building on Project Soane, and I had been working up some design development studies using Phasing. At first I thought phasing might be the problem (can definitely slow things down) but the way I fixed it was by simplifying my Corinthian Column family. It's a massing study so I don't need all that detail anyway. But next morning I was struck by the idea of using a new approach to a simplified Corinthian Capital. Basically it uses two octagonal blends, (one rotated 22.5 degrees in relation to the other) to stand as placeholders for the two rows of acanthus leaves. For the scrolls I used extremely simple extrusions and the whole thing turned out to be extremely lightweight: 600kb as opposed to the 6mb of my original. I had been quite proud of getting a Corinthian column down to 6mb. One of the versions we had during the competition stage of Project Soane was over 100mb. But there's a lot to be said for a really lightweight placeholder. By elaborating the sketch for the blends slightly I got something even better with a negligible increase in file size. But then I got to wondering what it is that pushes the file size up by a factor of 10. I tried deleting different parts of the capital one by one and soon discovered that my scrolls were the main offender. So although I had started this exploration with an idea for replacing the leaves, the real breakthrough came from remaking the scrolls. And in my view they were the weakest link anyway. I was never really happy with the way they looked, but hadn't found the energy to try again. It seemed to me that the trick was to just use a series of solid extrusions. Has to be the lightest of lightweight modelling methods. So I made a sketch like an apostrophe (or a tadpole) and to be more faithful to @theRealCorinthian, had two of these at each corner, splayed apart slightly. Then borrowing a trick from the Funny Fireplace post I did a couple of weeks ago, I added a cylinder that passes through both and projects slightly at each side. I'm happy with this as a way of tricking the eye into seeing what it expects to see. The result is a Corinthian Column that weights in at about a quarter of the size of my previous attempt, and to my eye it looks a good deal better also. I will be updating my column collection and re-sharing it shortly. Project Soane continues to surprise me with new twists and turns. The Slack group we started a few weeks ago has proved very fertile. I do encourage more people to join (or rejoin) our little endeavour. If you have any interest at all in History, Buildings, Architecture, the Enlightenment, the Industrial Revolution ... this is a splendid way to pursue that interest in a very practical way. That study was a non-parametric analysis of how the technology works, and I used Revit because it's my favourite drawing tool. The ease with which you can develop multiple orthographic views of an object from a 3d model, (dimensioned, annotated and arranged on sheets) is hugely valuable when you are exploring building technologies, whether old or new. I am dumbfounded that this has not caught on more as a didactic method in Universities around the world. 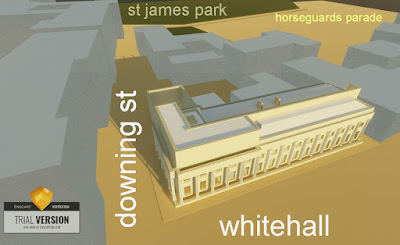 Over the past couple of weeks, I have taken the knowledge gained in my previous study and applied it to creating useable families for our model of the Board of Trade building, at the corner of Whitehall and Downing Street. There are two models, loaded up into the Project Soane website on BIM360 and accessible using C4R. The first is a context model, quick massing studies of some of the very interesting historical buildings that are crammed into this area, so familiar to tourists from all around the world. In the view below, they are colour coded by age. Those that were there in Soane's day are solid. Those built later are transparent. Yellow means medieval. Orange is 17 century and Red 18th. Soane's Board of Trade is the more heavily detailed, monochrome, L-shaped block. 19th century is transparent pink, and 20th very pale violet. Westminster Bridge was the second bridge to be built across the Thames, and was still quite new in Soane's day. You can immediately see that the Board of Trade represents the beginnings of a huge expansion of the Civil Service that was to occur during the Industrial Revolution as Britain flooded the world with Cotton and other factory-made goods. This was the first model I ever opened up in Enscape and I was immediately impressed by this shot of Whitehall from the Thames, with Westminster bridge and the Houses of Parliament on the left, and the 1940s Ministry of Defence, centre right. At that stage the Board of Trade itself was fairly crudely modelled. This is the second file on C4R of course, and here it is, viewed using Enscape, with Downing Street centre left, heading towards St James Park. The space behind the buildings (top right) is Horseguards Parade, where you can watch the "changing of the guards" ceremony: uniformed men with swords, on horseback. It's a remnant of the age that was slipping away almost imperceptibly during Soane's lifetime, when the Privy Council Chamber was still a meeting place where senior members of the aristocracy met to advise the king. That's the open-topped space that terminates the shorter leg of Soane's building as it projects into Downing Street. By the way the building is incorrectly labelled as "Soane's Treasury" in these images. I was taking my lead from Wikipedia which is quite misleading. It is now known as Treasury Buildings, and houses the Cabinet Office but in Soane's day housed the Board of Trade and Privy Council Offices. The buildings in the Site Context model are represented by families. This keeps everything nice and lightweight, while allowing properties to be added and scheduled, so we can keep track of the architects and dates of construction. Eventually I would love to apply phasing to this model and create some kind of a time lapse study. There is also a sheet of compiled web clippings recording research done to date. Often these windows have splayed internal reveals that extend to floor level and may contain folding shutters. By making the void cut as a nested component, we can swap out different versions. Later sash windows fitted into thinner walls would be finished more simply with architraves and a horizontal wooden sill, finishing flush with the interior wall face. I haven't modelled any internal shutters yet, but the splayed reveals are showing up nicely. I love the quality of light in Enscape's internal views. It takes so long to get a decent internal render with Revit's built-in engine, but here we are getting splendid results almost instantly. Notice that the 'trial version" watermark has disappeared now. I have activated the 6 month license that they so kindly donated to the cause of Project Soane. The glazing bar profiles started as a simple rectangle, but later I developed a parametric version of the typical "lamb's tongue design" that became more or less standard. It's amazing how much slimmer they appear, after adding a couple of delicate mouldings to the corners of a square piece of timber. There are a few basic formulas to allow for equal-sized top and bottom lights (or not), with a simple tick box. I had more elaborate versions that allowed the setting of different glazing bar configurations parametrically, but this started to affect performance, so currently I have a collection of "GRILLE" components to cover the different cases, and load whatever I need for each particular case. While I was at it, I spent a day or so building standard steel windows on the same lines. These are very common in Africa and provide an excellent solution, given the local climate and the nature of the construction industry. I developed a set of Autocad blocks for these over 20 years ago, so it felt quite good to do the "BIM equivalent" I hope to share these later on, once I've cleaned them up a bit. Meanwhile the timber windows are looking quite good in a plan view. The inset shows the state of the model at this stage. I decided to break off the family development exercise and put some time into the building itself. A day or so later the rear elevation is shaping up nicely. It seems that Soane incorporated an existing house into his design (the previous location of the Board of Trade, I think) At first his commission was simply to enlarge this house, but at some point the Privy Council Offices were added to the brief and the project doubled in size. I love to trace his design development processes and building a Revit model is a great way to query the source material. To one side of the original building he added (or extended?) a staircase which provided access to the new attic rooms along the Whitehall frontage. There is a magnificent central corridor with barrel-vaulted skylights, running down the centre of the main block. Figuring out how this works was another rewarding detective puzzle. As usual he is quite inventive in the way he divides the wall surface up with decorative panels. Anyone familiar with London will know about the recessed "areas" between pavement and building that provide light and ventilation to the basements. Very often these are semi-basements, two thirds of a storey down from the street, with a substantial number of stairs leading up to the ground floor entrance doors. I always think that one of the marks of a good architect is the ability to blur the lines between spatial drama and pragmatic solution. The central corridor is/was a magnificent space but it also serves to bring borrowed light into the attic rooms, separated as they are from the external wall along Whitehall by an access passage. I have a tendency to flit back and forth when I'm modelling. I suppose I'm trying to balance things off, gradually raise the level of development across the whole model, whether that should be "getting the planning right" or "fleshing out the details" Nothing quite like an entablature moulding for raising the impression of completeness. Mr Soane did like his complex roofscapes, but there's always a rationale in terms of bringing light in from unexpected angles, especially into stairs and corridors, which can so easily become such dismal spaces. Starting to develop sheets in the model now. It's interesting to compare the front and rear elevations. He has created a grand colonnade along Whitehall. In fact he produced many, many schemes to extend this further, but was thwarted by their lordships, (his clients). But to the rear, the impression is of a row of varied terraced houses, very much the way that the Whitehall façade was before his intervention. So he leaves a memory of the past at the rear of the building. Note how I'm still using placeholder families here to represent the windows. Adding rooms (with the automatic placement feature) allows us to use a colour scheme to show how the building is divided into two departments. Hopefully we can allocate names to most of these rooms by poring over the drawings and accompanying notes in the Soane Museum online archive. I've said it before, but what an incredible resource! And finally sections through the main spine, looking both ways. You can see the borrowed lights at high level, and the way he uses the moulded panels to hide the irregularity of their placement. Lots of detail to add yet, there are brackets at ceiling level (modillions) and Greek key designs in the long horizontal panels. What larks Pip!